Come! Step Out onto the Water! With the quickening of the night breezes, the wind shifted and increased until a small fishing vessel pitched and yawed with every punishing wave. The boatmen were exhausted from working all day, and now they had to use the last of their strength to keep the boat from being swamped. The men must have grumbled. “Why has the master asked us to set out at night after we worked all day?” one might have said. “We fed 5,000 people today! Wasn’t that enough?” another possibly added. But then, the Master spoke. “Take heart! It is I; do not be afraid!” And though the men saw Jesus with their eyes, they could not wrap their minds around the fact that He walked on water. No one could walk on water…..could they? Full of brash boldness as always, Peter jumped out of the boat and began walking toward Jesus. What did he feel in those moments? “Look! I’m doing it!” he might have shouted as he stared intently into his Lord’s eyes. But then the wind rose and the waves came up, and suddenly the man of faith looked not at Jesus, but at the tempest. Fear rose up in him and replaced his faith, and Peter cried out, “Lord, save me!” Immediately, the Word tells us –IMMEDIATELY, Jesus reached out his hand and rescued Peter. And when the two men climbed into the boat, the storm stilled and the other disciples worshiped Jesus as the true Son of God. There are so many lessons to be learned from this one little story! Why did Jesus have the men push out to sea after such a long day? Maybe to show them, and us, that when you think you’ve done all you can do, He gives you strength to endure. Why did Jesus wait so long to come to them? Why didn’t he come before the waves and wind became dangerous? We all want to be rescued before the storm starts. It’s human nature. But if we could all sit around on satin pillows, having our every wish and need fulfilled before we even ask, never facing anything difficult or sad or frightening in our lives, what type of people would be? Weak, ineffective and useless to the Kingdom of God, that’s what! It’s the constant battering of wind against trees that strengthen and harden them. Trees that are in dense forests where the wind does not reach them don’t put down deep roots, so they easily topple. God doesn’t want us to be easily toppled when Satan blows winds of adversity our way! Why did Jesus ask Peter to join him? That one simple command from Jesus – “Come!” – speaks volumes. He is open to us. When we call to him, he is there. And He wants us to be effective for Him. He didn’t say to Peter, “No, this special privilege is reserved for me only.” He said, “Come!” Jesus tells us that we can do all the things he did and even more, if we only have faith. In John 14:12, He says, “I tell you the truth, anyone who has faith in me will do what I have been doing. He will do even greater things than these, because I am going to the Father.” Does Jesus need us to walk on water? Probably not, but if we read this passage with a discerning mind, we will know that whatever he calls on us to do, no matter how difficult, He will enable us to complete the task. Why did Peter Fall? The answer is so simple. He took his eyes off the source of his strength and looked at the circumstances instead. Satan will always magnify the circumstances in our minds if we allow him to. When the waves threaten us, and the stormy winds blow in our relationships or finances or health, looking at the storm will only increase the fear. When I was a child and was afraid of a storm, my mother would get me to play cards with her or do something else to take my mind off the situation. Before I knew it, the storm was over! As long as Peter’s mind was off the situation, as long as he looked to Jesus, the author and finisher of his faith, he could stay above the waves. But one look at what the enemy was throwing his way, and his faith went down in one mighty gulp of fear. And while Jesus did rebuke Peter for his lack of faith, mercifully, He also reached out his hand to keep Peter from drowning. Jesus wants us to have faith. To look at Him and not to the right or left, but only at Him. Yet he knows we are human, and that we succumb to our fears. So while he gently calls us out for not holding onto our faith, His hand is reaching out in deliverance at the same time. When the Going Gets Tough….The Tough Start Praising! I don’t remember a time that I wasn’t either singing or playing an instrument. And although I’ve sang and played a variety of music genres and instruments, at the center of my repertoire….at the center of my very being…is praise. I’ve made it through some of the hardest times in my life with praise! We live in tenuous times. Financially and politically, we as a nation, and as a church, are going through some of the hardest times many of us have seen in this country. Our tendency is to talk about it, gather at Starbuck’s and commiserate with our friends while we hash and rehash the problems over and over, but what does that accomplish? What should we do instead? I want you to know that when the going gets tough, the tough start praising! God ordained praise to help us overcome the challenges and obstacles that our enemy Satan, who goes about like a roaring lion, puts in our way everyday. It doesn’t matter which form your praise takes, as long as you are worshipping in spirit and truth. Praise can be sung, played, shouted and danced as we see throughout the Old and New Testament. The Bible indicates in Ezekiel 28 that Lucifer, or Satan, was the chief musician of Heaven before he became jealous of God and aspired to be like Him. In verse 14, we are told that his “timbrels and pipes” were set in gold and created in his very workmanship, or being, on the day God created him. Imagine how beautiful Lucifer must have been! A timbrel is a tambourine and a pipe is a flute or woodwind instrument. Music was not something Lucifer created with an external instrument – he WAS the instrument! Apparently, he had the ability to make orchestral sounds within himself, and his body was at least partly made of gold. But Lucifer despised God and wanted to take his place, so he was cast to the earth because of his war against God. And when he hit the earth, a fire came out of Lucifer and consumed his beautiful form to ash, taking away the music that was meant from the beginning to glorify God. How fitting it is then, that God uses worship music to overcome the enemy! His word teaches us that when we praise, He sets ambushes against the enemy. (II Chronicles 20:22.) It also tells us that God inhabits, or dwells, in the praises of his people. (Psalm 22:3) Now we already know that if God is for us, no one can be against us! So when we praise, we are inhabited by God himself, and the enemy doesn’t stand a chance. When we praise God, He comes to our rescue! Consider the story of Paul and Silas in prison. (Acts 16:16-25.) The two men had been beaten and abused for their ministry, then chained and thrown in prison. Verse 25 says that at about midnight they were praying and singing hymns to God, when an earthquake caused their chains to fall and the doors to swing open. Not only were they freed, but ALL the prisoners were freed, and the jailer and his family accepted Christ because of this act. At a time when most people would be singing Poor Poor Pitiful Me, these two men of God were praising, and God defeated the enemy’s plan in that moment! And not only did their praise affect their own circumstances, it brought freedom to those around them. Be assured that no matter how big the wall in your life is, no matter how tight the prison door is locked or the chains are wrapped around you, God inhabits your praise. God ascends to His throne amid your shouts of joy, and he sets ambushes for your enemy. If you have a heavy heart, or you’re facing obstacles you don’t feel you’ll ever overcome, I want you to have hope. GOD wants you to have hope! Worship God with all your heart. Throw your hands up in the air and shout your hallelujahs. Don’t look at the circumstance, but look at the Deliverer and thank him for his soon-coming rescue! 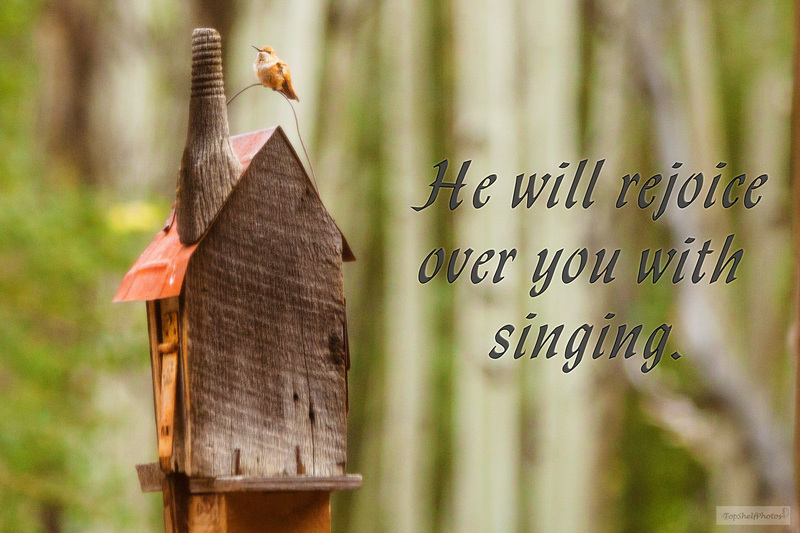 Sing songs of praise and let faith rise up in you. Trust God that, just as he did with Paul and Silas, he will deliver you from your chains, too!